Butterball coupon is a coupon found on Betty Crocker packages. The coupon is on specially marked Betty Crocker Potatoes. 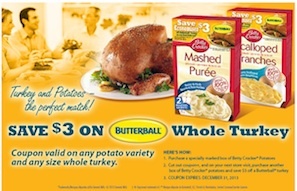 This is a coupon to Save $3 on Butterball Whole Turkey when you buy any specially marked Betty Crocker Potatoes. You can find Betty Crocker Potatoes in any supermarket, grocery stores, Walmart and more. A tasty companion to any meal, that’s ready in just 8 minutes! 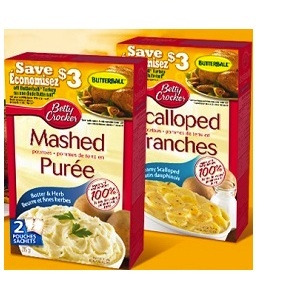 Your family will love Betty Crocker flavored mashed potatoes. They’re made with 100% real potatoes and blended with just the right seasonings. And with 8 different varieties of flavored mashed potatoes, you can bring more variety to your family menu, without any extra work.